Baijnath is a town in Kangra district of Himachal Pradesh. It is about 50 kilometres from Dharamshala which is the district headquarters.The very famous ancient temple of Lord Shiva (Baijnath) is situated here which is believed to be one of twelve jyotirlingas according to popular legends also giving the town its name . Baijnath is famous for its 13th-century temple dedicated to Shiva as Vaidyanath, ‘the Lord of physicians’. Originally known as Kiragrama, the town lies on the Pathankot-Mandi highway (National Highway No. 154) almost midway between Kangra and Mandi. The present name Baijnath became popular after the name of the temple. The town is located on the left bank of the river Binwa, a corrupt form of ancient Binduka, a tributary of river Beas. 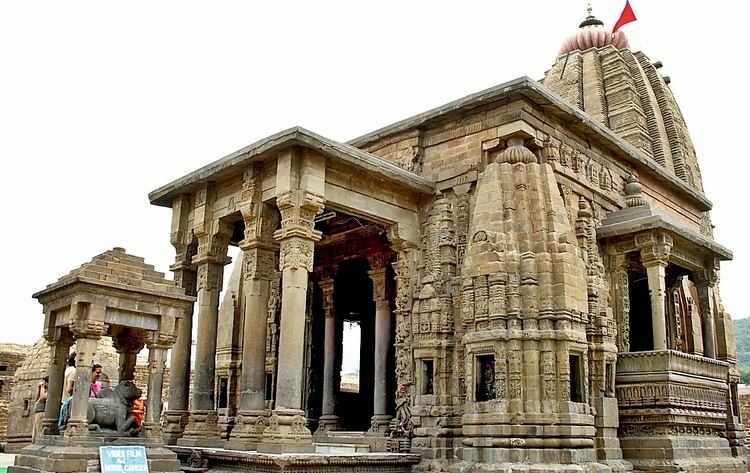 The Baijnath temple has been continuously under worship ever since its construction in 1204 A.D. The two long inscriptions in the porch of the temple indicate that a temple of Shiva existed on the spot even before the present one was constructed. The present temple is a beautiful example of the early medieval north Indian Temple architecture known as Nagara style of temples. The Svayambhu form of Sivalinga is enshrined in the sanctum of the temple that has five projections on each side and is surmounted with a tall curvilinear Shikhara. The entrance to sanctum is through a vestibule that has a large square "Mandapa" in front with two massive balconies one each in north and south. There is a small porch in front of the mandapa hall that rests on four pillars in the front preceded by an idol of "Nandi", the bull, in a small pillared shrine. The whole temple is enclosed by a high wall with entrances in the south and north. The outer walls of the temple have several niches with images of gods and goddesses. Numerous images are also fixed or carved in the walls. The outer doorway in the porch as also the inner doorway leading to the sanctum of the temple are also studded with a large number of images of great beauty and iconographic importance. Some of them are very rare to be found elsewhere. The temple attracts a large number of tourists and pilgrims from all over India and abroad throughout the year. Special prayers are offered in the morning and evening every day besides on special occasions and during festive seasons. Makara Sankranti, Maha Shivaratri, Vaisakha Sankranti, Shravana Mondays, etc. are celebrated with great zeal and splendour. A five-day state level function is held here on Maha Shivratri every year. Baijnath is around 51 kilometres from Kangra. Besides the main temple there are several other shrines which are of equal importance for the local residents. Some of them are Mukut Nath temple at Sansal (6 km)and Awahi Nag temple (1.5 km) the Mahankal Temple (5 km) at Mahankal on Chobin Road , Shobha Singh Art gallery (Andretta/Panchrukhi 11 km from Baijnath). The town offers splendid views of the Dhauladhar Ranges and numurous mountain streams. Tibetan Monasteries at Sherabling (Bhattu)(5 km),Chauntra and Chowgan on the Mandi Highway and at Bir(14 km). Billing(28 km) is an international paraglding site which is considered as one of the best in the world for paragliding and other aerosports .The site has been the host to international events such as the Paragliding Pre-World Cup multiple times and other national and international events.